"Hash brown potatoes are baked with green onion, mushroom soup, milk, Cheddar cheese and green bell pepper. Scrumptious!" Melt butter in a large skillet over medium heat. Saute onion until tender. 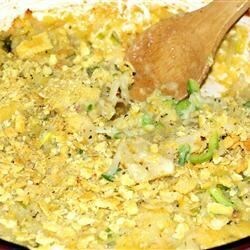 Stir in potatoes, soup, milk, cheese, bell pepper, black pepper, and 1/2 cup cracker crumbs. Transfer to a 2 quart casserole dish and top with remaining cracker crumbs. See how to make creamy, incredibly tender scalloped potatoes. Very good and quick. Was a hit at the company potluck ! Not for the weight watchers, but these are really yummy! Can you believe this is the first time I've ever had a hash brown casserole? This is so simple and very good!! The under five set in the house even ate the green peppers! This was really good! My kids picked out the green pepper but otherwise liked it. I didn't cook it in the skillet but mixed it in the casserole dish and baked it.